I clenched my thoughts tightly to keep focused on the goal and away from the cold fear. All was in order. The plans had been laid carefully. The amount of time and death that it had taken to come to this point was staggering. I prayed for the success of the mission. We must not fail. Too much was at stake. I touched my inner pocket to assure myself that the device was still there. I breathed a sigh of relief. It was indeed safely sewn into my vest. I was still amazed and grateful that it had never been found during the years we had been subjected to residing in the squalor. I had met Krystal there. We endured the trials of our detainment and stayed sharp. We planned our escape and subsequent rescue mission carefully while the weaker ones around us perished. Our only comfort was that we would eventually put an end to the suffering. I would never forget the vivid images of the faces of those who had been lost. It stabbed my heart that I had been helpless to save them. But we would save the others. We had successfully rounded up the youngest ones in a safe haven until we could complete their extraction from this horrible existence. I crept silently down the darkened corridor. Vague blue lighting from an unknown source provided dim vision. I approached the unremarkable metal door and tapped a coded series of knocks. I waited for it to open. Krystal’s face appeared in the small opening that she allowed to assure herself of my identity. Upon seeing my face, she opened it wider. She was dressed in smart, black, professional attire, as was I. It was a far departure from our normal shabby clothing. “All is well with the children?” I whispered. Krystal nodded and gestured toward the large group of gnome-like faces gathered about the room. The blue glow shone dimly on their thin and dirty features. Not even the smallest one uttered a sound. They all knew the gravity of the situation. Krystal stepped away to address the two women that we were leaving in charge of the children. After quietly spoken last minute instructions, she slipped out of the door and closed it quietly. We could hear the latch from the inside grinding into place. We began our course through the twisting labyrinth of underground tunnels. We had no need for a map. We had memorized our path. Presently, we reached the door to the control center. After checking each other’s appearance one last time, we entered the hub of activity with briskness and poise. The contrast in lighting was a shock. It was difficult not to blink and squint in the extreme brightness. The immediate goal was to march through the center and out the front door without attracting attention. Corporate activity bustled all around us as we purposefully made our way through the immense room. A heavy set woman with burnt orange hair stepped in front of me to halt my progress. Her full lips were coated with lipstick a shade darker than her hair. Her painted on eyebrows were of the same hue. She adjusted her black rimmed glasses on her nose and spoke again. “Of course, Ms. Trodeau,” I replied without hesitation. I opened the leather file that I carried and shuffled through the pages therein to locate the appropriate paperwork. A few sheets escaped my fingers and fluttered to the floor. I tried to laugh casually as I stooped to retrieve the errant papers. What a fun way to start my day! True story! Love it! I want to be a double super secret agent! Here’s some coffee, love! You would so totally rock as a secret agent! And I am always so thankful for more coffee! What did you eat the night before to be visited by such a dream? Thanks for sharing… it was lots of fun! Lol Does your food effect your dreams? I never considered that! At least it wasn’t a nightmare. I enjoyed the ride! Are you following stories about me today, Rob? LOL. That’s okay if you are…I think it’s cool! I can’t wait to read what happens next. I can’t help it… you’re so popular…. 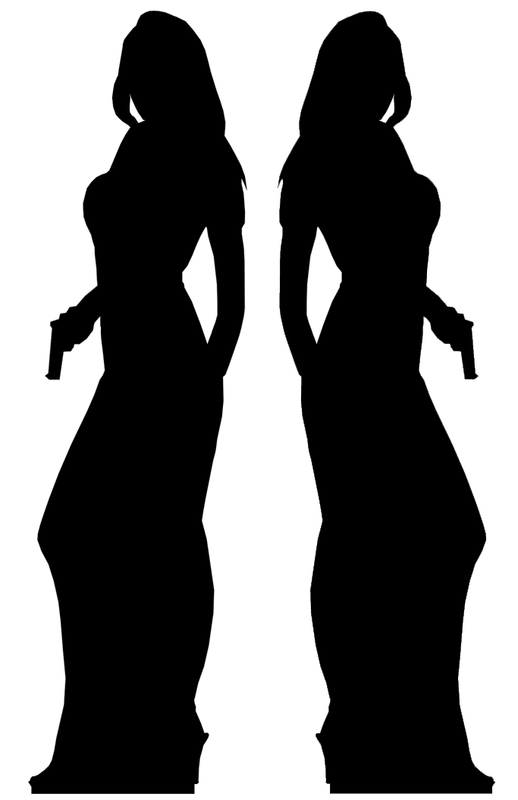 Okay, which silhouette is Kellianne and which is Krystal? I can’t tell. Wishing you both great weekends. We will never give away our identity!! Wow, that’s a pretty eerie dream. I know it’s not the point, but I still want to know… what was in the report?! What about all those kids?! How about putting the coffee down so you you can go back to sleep until you see what happens next? Told you it would make a great blog post! Lol, I enjoyed that! Hopefully more to come. I am so glad that you enjoyed! Yes, there will be more, but as a fun twist I’m going to have other authors continue the story!